Compress video size without any quality loss to send large videos via email/Android/iPhone and other devices. Support 1,000+ video formats for compression and conversion. Compress video and audio files in batch process. Many users struggle with the process of sharing files with phones or sending large attachment via email. Sharing media files between different platforms is still a little complicated. That's why people are always searching for how to send long videos via email, phone, and any other service. Actually, you can find many methods easily to reduce video size or sharing with other tools. In this article, you'll learn different ways to send large HD videos via email, iPhone, Android phone, and the 3rd-party applications. If you want to send long videos or audio files via email attachment, you should compress its size first. 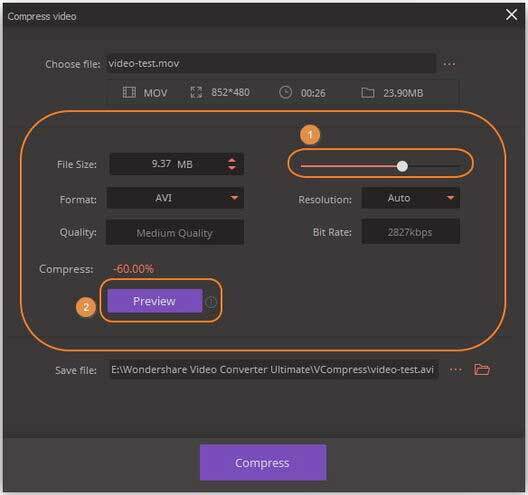 Wondershare UniConverter (originally Wondershare Video Converter Ultimate) is the all-in-one video tools to compress large video/audio files without any quality loss. It is a complete utility toolkit to fulfill all your requirements regarding media files. It can be used to download, convert, compress, burn and editor videos with simple steps. You can use this software as the best large video file converter and compressor so that the files can be played and shared on any device without any limitation. Compress long videos to small size without losing any quality to share via email or phones. Customize video size by selecting video resolution, changing bitrate, converting video format, etc. Edit videos with features of cropping, trimming, rotating, adding watermarks, applying effects, and others. Check compressed video quality with 20s real-time preview. Transfer videos to iPhone/Android devices easily via a USB cable. Batch video/audio compression and conversion are allowed. Begin with downloading the software on your computer and installing it. Then launch the software and switch to the Toolbox tab from the main interface. Click on the Video Compress option to start the process. 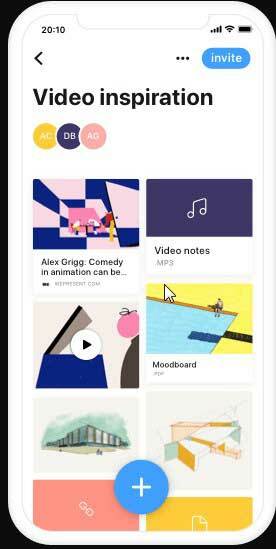 A new pop-up window will appear, click on the + icon to select videos on your local computer and tap on the open button to load the file. After the video have been loaded, the software will display the size and other information of it. 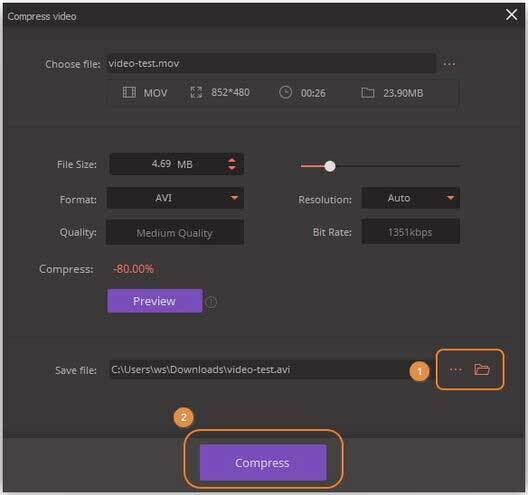 Customize the file size, video format, video resolution, and bitrate directly, or drag the process bar to changing all parameters accordingly. You're allowed to check the compressed video quality for 20s by clicking the Preview button. You can customize the file location by tapping on the Save file: option. 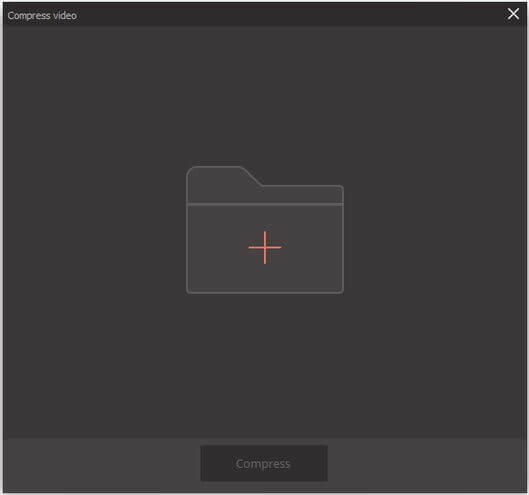 Finally, click on the Compress button to convert and compress long videos in a minute. Once the compression process is done, locate the file in the storage and switch to the Transfer tab in the software interface. Connect your device with a USB cable and click on the Transfer button to send it. You can skip this step if you don't need to sync your videos to phones, and click on how to transfer videos to devices >> to know more details. For Android users, the best 4 apps that we have gathered to help you understand how to send a video that is too large. You can download them on your Android phones and use them to compress and send big video files. As the name signifies, the app will tell you how to send large video files from Android. 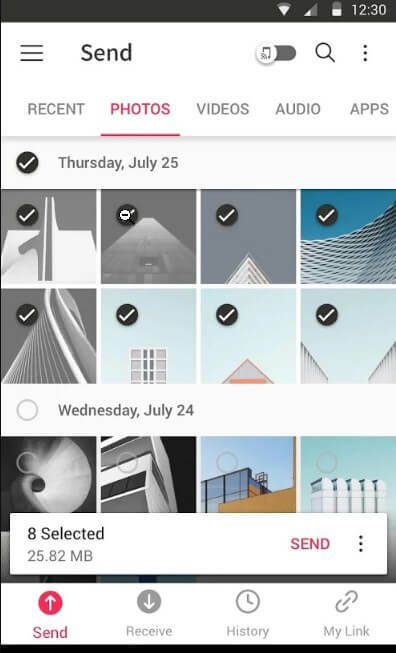 The app has the capability to upload 50 GB of the files at once and can create a link for 1 TB. The app uses the Wi-Fi technology for file sharing and hence it is fast and efficient in transferring files from one device to another. The app will send the file without changing the original quality of the video. You will need a onetime 6-digit key make the connection for file transfer and then share the file to any specific device. You can use this tool to share photos and music files. You don't have to depend on the mobile data to send large videos. Most of the times, the videos received on the device are not displayed in the gallery. The app needs a lot of permissions to work effectively. If you want to know how to send large videos on Android, then WeTransfer is the most ideal app for this. The app can capture, collaborate and combine the ideas from all your apps in just one place. You can save the content of other apps inside the WeTransfer app. It can save photos, links, documents, videos, and other stuff too. You won't require any sign-up or login to start sharing. You can share the link through email, text message, WhatsApp, Facebook messenger or any other channel directly from the app. It is like an online sharing platform from where all the added accounts can check and send the media files easily. The app is very useful in organizing media. It has a very interactive user interface. It can also create a link for the media files. The sharing board sometimes doesn't display the shared file which is confusing. 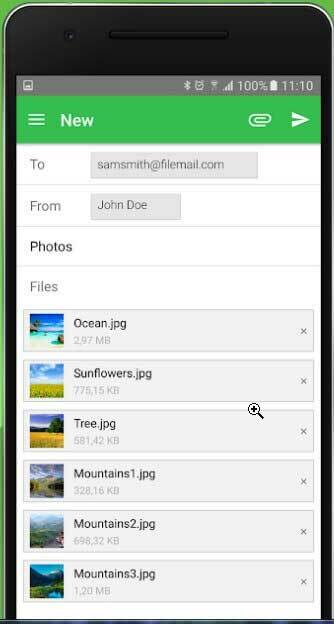 The users who would like to send an email of large video files from any mobile device, they can use the Filemail app. 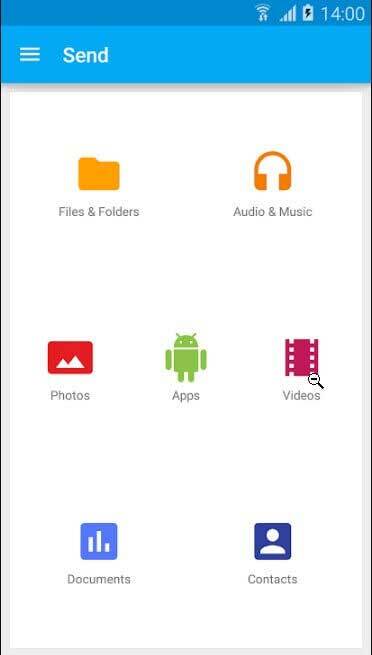 This app allows users to share pictures, music files, videos, and other files from any Android device via email. The app will automatically guide you on how to attach a video to an email and send it to others. As soon as you hit the send button of the email, the target user will receive the email with the link of the video in it. And the best thing is that the app is completely free and you can send an unlimited number of shares and downloads. It is a fast and easy way to send large videos by email. There is no file size and file number restrictions. The target users can download the files directly from the Filemail app. Sometimes, an error occurs while sending many files. The app also crashes sometimes. SuperBeam is another large video sending app so that the users can share files among device using Wi-Fi. The app works by pairing up the device using QR codes included the QR scanner, NFC, or manual sharing key. The users who don't have the app can also use the web interface to share the files. The app will keep the complete history of the files shared using SuperBeam. The app is also available in the Pro version which is completely ads free. You will be able to share an entire folder and an unlimited number of files at the same time. if you want to know how to send large video files from the phone, then SuperBeam is the best app as you will also get the app for Windows, Linux, and Mac too. The app has a super easy interface. It will allow you to share the file with more than one device at the same time. Sometimes, the app fails to write data to SD cards. The app consumes a lot of battery even while running in the background. Want to send a large video file from iPhone? Don't know reliable methods to send a large video from iPhone? Here, we have mentioned three efficient methods that you can use for sending large video files from iPhone. 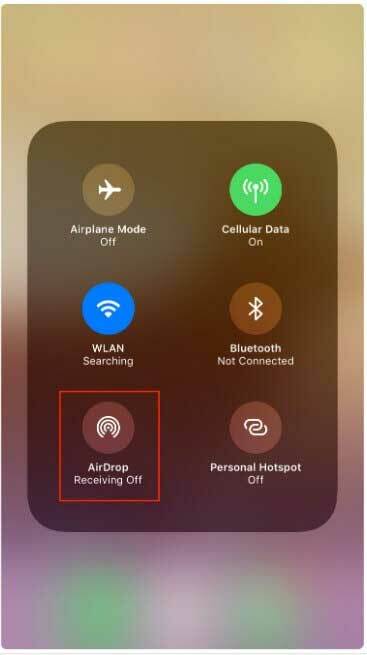 AirDrop is Apple official file transfer service among iOS devices and Mac computers over the air. With iPhone AirDrop, you can share and receive videos, documents, images, etc with other nearby Apple devices. It is both an easy and quick way to send large video from iPhone to another Apple device that is close to you. Wondering how to send long video from iPhone via AirDrop? All you need to ensure that person to whom you are sending is within your device Wi-Fi, and Bluetooth range. To transfer files between iOS devices, AirDrop is the most preferred way. It is an inbuilt feature in iPhone and there is no need to install anything to use it. It does not require network connections while transferring files. It transfers files with high speed. It only works with the particular iOS device, such as iOS 7 or above. There is a need for new models of the wireless. Apple iTunes is great phone management application that many iOS users use it for syncing the files between various iOS devices. You can also use iTunes to share large videos from iPhone to another iOS device. Now, how to share large video files from iPhone via iTunes? First of all, you can sync or import video file to iTunes library you want to share and then, you can then sync added video file from iTunes to an iOS device to which you want to receive. Thus, iTunes is another option for those who are looking for the method on how to send large videos. There will be no data and quality loss while sharing. You can share unlimited files with iTunes. It prompts to download new updates whenever you open it. Apple iCloud is a cloud storage service, and to share files between iOS device and computer, it is very helpful. With the aid of iCloud, you can access files, even large ones across different device and computer. Many iOS users use iCloud for their device backup. And how to send large video files from iPhone via iCloud is an easy and quick process. 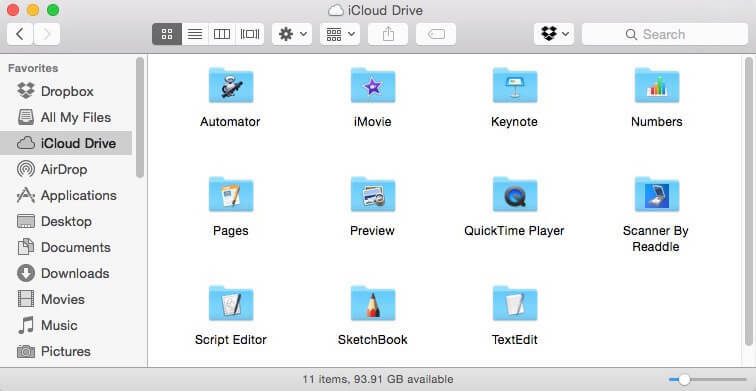 The files you want to share from iPhone, you can first add the file to your iCloud drive. Then, you can access the file from another device by accessing your iCloud drive. Sharing files between Apple devices, it is an easy and effortless way. You can also access iCloud from the non-iOS. Its free version has less storage space. It does not work with all non-iOS device. If you don't want to use the app in the devices, then there is always the cloud options which are supported by all the devices. Whether it is a Windows phone or PC, Mac or iPhone, the cloud storage services can help you to learn how to send long videos among iPhone and Android device or from Mac to Windows. Google Drive is the most popular cloud storage service available for both Android and iPhone users. The app can help you to learn how to send large videos from Android to iPhone and vice versa. 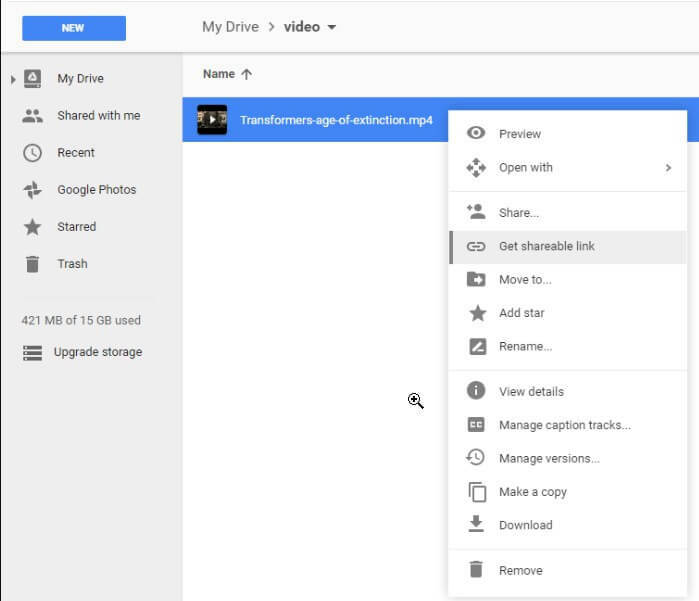 Google Drive will make it super easy to transfer, backup and sync the media files in just a few clips. The app is effectively built and allows the users to attach files to an email that are simply saved on the drive. You can further send large video files by composing an email. With Google Drive, users can share the link directly to the other email accounts. You can store up to 5 TB of videos. The app allows you to play a video of 1920 x 1080 resolutions but can store video of any resolution. You will need a Google account for the service. You might experience some processing errors while uploading and downloading the videos. Dropbox is another cloud storage service which allows the users to share a video which is too large to email. With the help of Dropbox, you can share the large video files from one to another including Windows, Mac, iOS devices, and Android devices too. 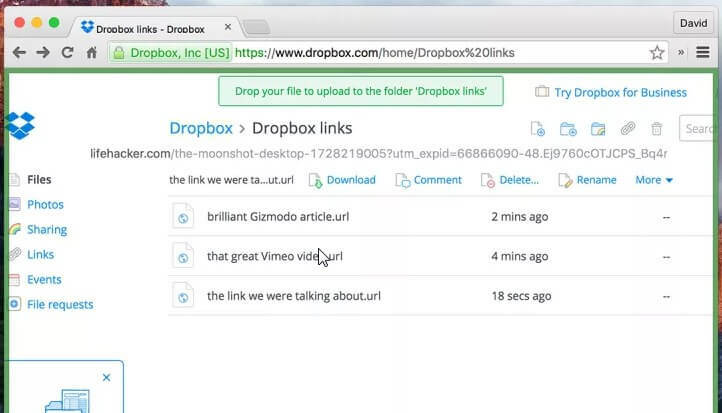 If you don't know how to send large video by email, then Dropbox can help you. The users can create a shared link of the file or folder that can be copied and shared via email, message, or social media chat apps, etc. The files can be downloaded and viewed by the recipient. The target users can receive the file without needing a Dropbox account. The storage of the service is only 2 GB for free. It is hard to locate the files if you copy the same file multiple times. Conclusion: All the users who are searching for how to send long videos can take advantage of any listed tool. But if you need software that would exactly work as large video converter and compressor and further allow you to share the files. 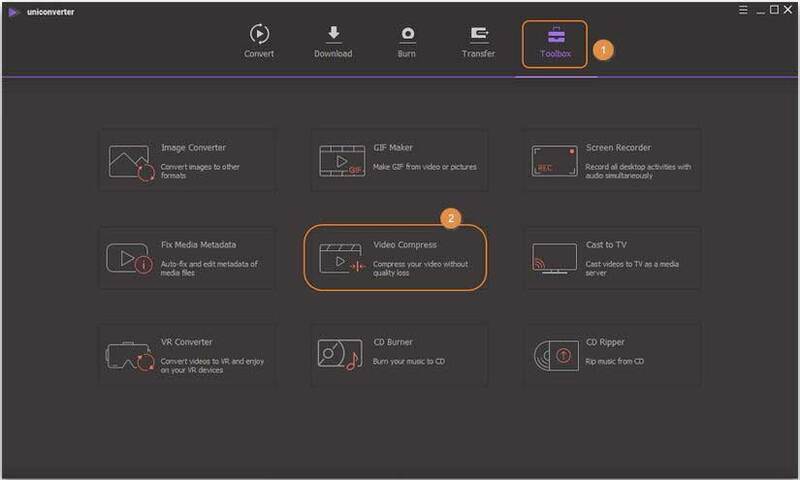 Then Wondershare UniConverter can do all operation easily, and keep your videos in original quality but small size so that you can share it through multiple platforms.